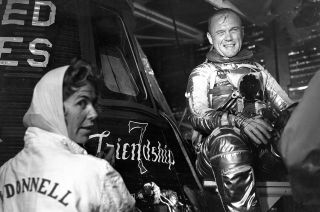 Artist Cece Bibby (at left) puts the final touches on the Friendship 7 logo as astronaut John Glenn looks on in approval. Cecelia "Cece" Bibby, who in 1962 was recruited by John Glenn to design and hand-paint the insignia on the outside of his Mercury spacecraft, died on Wednesday (Nov. 14), according to friends close to her. She was 84. Cece Bibby, whose "Friendship 7" logo flew alongside Glenn on his historic three-orbit mission, went on to create similar colorful designs for Scott Carpenter's "Aurora 7" and Wally Schirra's "Sigma 7" capsules. To apply the emblems to the spacecraft, Bibby became the first and only woman to ascend the Mercury launch gantry and go inside the "white room" that surrounded the vehicle. "Glenn wanted 'Friendship 7' done in script. He wanted it applied by hand and not by stencil and a can of spray paint," Bibby told collectSPACE.com in a 2005 interview. "The first trip out to the pad was to find the area where I was to do the painting on the spacecraft and to measure, because I [wanted] to do a large cartoon so I could trace it onto the capsule. I would use chalk to transfer my design to the capsule." Bibby spent most of her youth as a ward of the Masons, after her father's death when she was three and, six years later, her mother bowing to the pressure of raising her and her brother. Living at the Masonic Home for Children in Covina, Calif., Bibby developed an early passion for art using the basic supplies the home could provide. After graduating from high school, Bibby enrolled in an art school while working as an operator for a local telephone company. The job brought her, by chance, in contact with Dr. Theodore von Karman, one of the founders of NASA's Jet Propulsion Laboratory in Pasadena, Calif., but it was a want ad in a newspaper that led her to Cape Canaveral. Moving to Florida to work as a draftsman at RCA's missile division at Patrick Air Force Base, Bibby soon transferred to the company's publications department, "where we did all kinds of artwork," including engineers' ideas of space, she said. That led to Bibby being hired by Chrysler Aerospace in 1959, where she was brought on as a contract artist for the National Aeronautics and Space Administration — NASA. Her workspace was located just across the street from the astronaut office. The United States' first two manned spacecraft flew with their names — Freedom 7 and Liberty Bell 7 — stenciled with spray paint on their side. John Glenn wanted a more personal touch. "John said that when the boss uttered the words 'stencil and spray paint' it really got his dander up," Bibby said. "I got the job as a fluke, but I have been always glad that he really persisted in having the designer paint Friendship 7 on his capsule." Despite Glenn's insistence, Bibby was not well-received in the white room. "When I got up to the top of gantry I encountered the Pad Leader, who informed me that women weren't allowed up there. I was told to leave immediately," Bibby recalled. "I told him he'd have to take it up with John Glenn and I went ahead and did my job." Bibby said that because she was the only woman working on the gantry, she was subjected to taunts from the other pad workers, which slowed her work. "That, coupled with the fact that the capsule was being checked out and subject to movement or tests caused the whole project to take about a week to complete," she said. Ultimately, Bibby went on to paint three of the six Mercury spacecraft that flew, but her logos weren't the only artwork she created for the astronauts. Practical jokers, the other astronauts took full advantage of Bibby's talents to pull a "gotcha" on Glenn. Virgil "Gus" Grissom, who flew just before Glenn on Liberty Bell 7, challenged Bibby to paint naked ladies on Friendship 7 to shake up the "straight arrow" astronaut. Not willing to put her job in jeopardy, Bibby rejected the idea of painting pinup nose art but devised a plan to insert a drawing of a naked lady in the capsule's periscope such that the offending art could be removed before the launch countdown commenced. "I painted a naked lady with the caption that said, 'It's just you and me against the world, John Baby,'" Bibby said. Glenn discovered the art before his scheduled launch for the day was scrubbed. Rumors spread that the astronaut was upset by the prank but Glenn set the record straight, telling Bibby that he got a "big kick" out of the drawing. Bibby followed up with another painting. "Just before John's next launch date, I did another lady for his periscope view. She was not what he expected. She was a rather frumpy old lady in a house dress. She had a mop in one hand and bucket in the other. The bucket had "Friendship" on it in the same script as his insignia on the capsule." This time, the drawing's caption read, "You were expecting maybe someone else, John Baby?'" After a brief departure in 1962, Bibby left her adventures at NASA behind in 1970, choosing to travel the world with her husband, a naval officer. She ultimately landed in the small town of Blue Ridge, Georgia, where she resided until her death. In recent years though, Bibby was reunited with several of the Mercury astronauts and fans of her spacecraft artwork through autograph shows that were organized around the country. She also recreated her original three spacecraft logos for a commissioned series of painting and prints. Click through to collectSPACE.com to view archival footage of artist Cece Bibby painting John Glenn’s “Friendship 7” and Wally Schirra’s “Sigma 7” Mercury spacecraft, courtesy of Spacecraft Films.